Velvet Glove, Iron Fist: Another sock puppet? CRAE receives no Government funds. Fairly ambiguous, that. So why does a quick check on the Charity Commission website suggest otherwise? 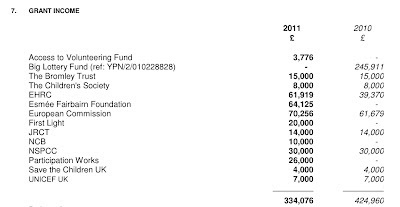 Their single biggest donor in 2010/11 was the European Commission. 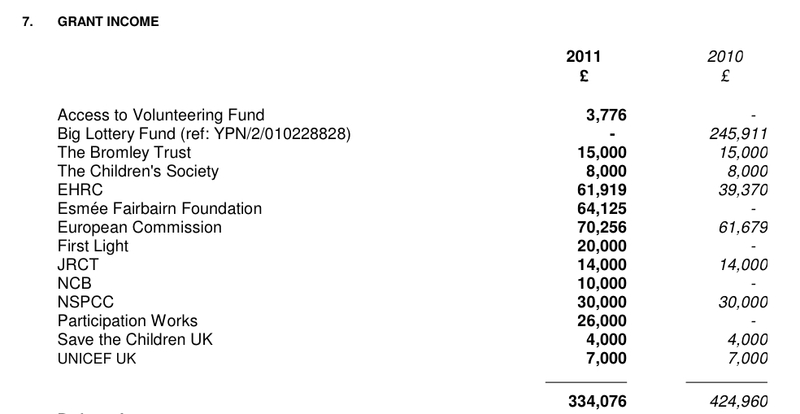 Their third biggest donor—with £61,919—is the Equality and Human Rights Commission. Unless I've missed a meeting, these both fall under the umbrella of 'government'. So, is it right for a pressure group that gets more than a third of its grant income from statutory sources to say that it "receives no Government funds"? I've written to CRAE to ask them about this discrepancy but—whadya know?—no reply. Riddled with common purpose trash too I'll wager. Even worse is 245k from the lottery.